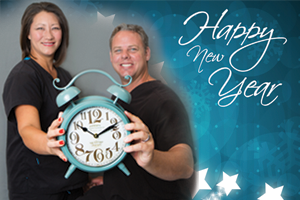 New Year…It’s Time for a New Smile! Among the many resolutions for weight loss, improved fitness, and better self-care, healthy teeth and gums are often lost in the shuffle. This year, resolving to improve your oral care can bring a host of benefits, in addition to brighter and more confident smiles. Lower risk of oral cancer problems. Every hour, someone dies of oral cancer. This disease has an excellent outlook when caught early. Every dental visit, you’ll be screened for oral cancers, increasing your chance of catching issues soon enough. Lower risk of gum disease. This infection of the bone and gum tissues is the leading cause of tooth loss in adults. It’s painful and often embarrassing, but completely reversible when diagnosed early. Good dental hygiene and frequent checkups are the best defense against gum disease. Better overall health. Yes, you read that right. Taking care of your mouth can help prevent problems throughout your body. Heart attacks and strokes are strongly connected to gum disease, so every time you brush and floss you’re lowering your chances of developing a more serious problem due to your oral health. Keeping your teeth. Most tooth loss is simply due to neglect. Taking better care of them means you’ll have a more complete smile and be able to enjoy your favorite foods more. Plus, you’ll be able to smile and speak with more confidence. Catching problems earlier. Even less serious problems like cavities and broken fillings are easier to treat when they’re caught early. Regular visits will allow your dentist to see these warnings signs and come up with a solution before things progress severely. Better breath. Around 85% of people who suffer from halitosis, or persistent bad breath, have the problem because of a dental issue. With good oral hygiene, you can prevent and repair problems for a more confident smile. Even if you understand the benefits of better oral health, you might not know where to start. Taking control of your mouth is actually quite easy. All you need is dedication and some basic tools. First, brush your teeth at least twice a day, every day. Make sure you’re cleaning them for a full two minutes during each session for maximum effectiveness. Gently scrub the inside, outside, and chewing surface of every tooth, and don’t forget your tongue and gum line. You should also floss every day. Many people skip this step, but in many cases, it’s the only way to remove stubborn bits of food from the spaces around your teeth. Follow the curve of each tooth gently, never applying too much force. You want to clean around the gums without damaging them. And last but not least, see your dentist often. You should have checkups at least once per year, but special needs cases might need to visit more frequently. Only your dentist can tell you what condition your teeth are in and make a personalized plan to make this year better than ever for your smile.